An illustrated talk by Dr Geri Parlby on the colourful ancestors of the Dukes of Bedford. Wine merchants, poisoners, mine owners and creators of afternoon tea – the colourful history of one of England’s oldest aristocratic families and the fascinating art that surrounds them. The story of the Russell family from the 15th to the 20th century. Dr Geri Parlby, BA (Hons), MA (Courtauld), PhD, FRSA is a former Fleet Street journalist and film PR. She has a Masters in History of Art from the Courtauld Institute and a Theology doctorate from Roehampton University in London. She has been lecturing for the past 12 years both in the UK and internationally. She is also principal lecturer on the NADFAS South West Area’s History of Art course and is an Honorary Research Fellow at Roehampton University and a Fellow of the Royal Society of Arts. 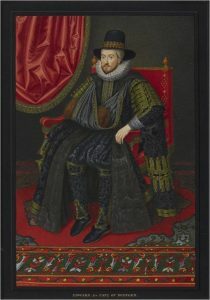 Image: Edward, third Earl of Bedford.